When I travel around Bangkok, I almost always have my camera out and ready because it seems inevitable that something interesting will cross my path. The other day it was this ancient pickup truck, parts of which looked like they were held together with bubble gum and baling twine. Perhaps the driver was checking out that Toyota next to him? And check out the texture on that front fender – how many times has that been tapped back into shape with a hammer? 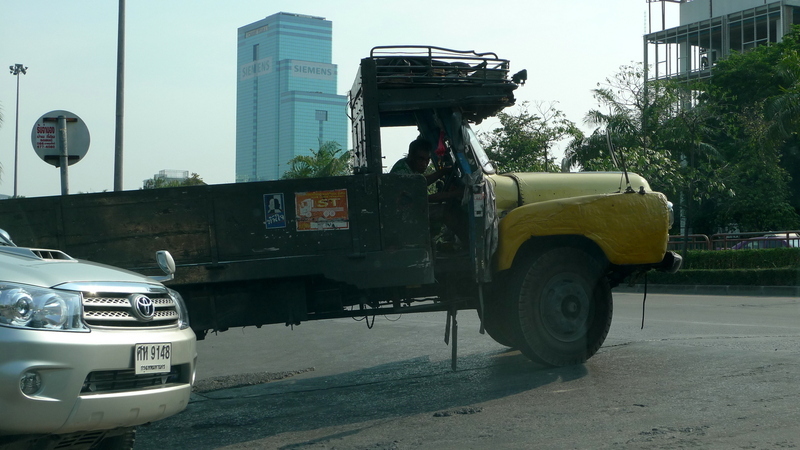 This entry was posted in Uncategorized and tagged automobile, Thailand, truck, Vehicle by christao408. Bookmark the permalink. Just a well loved truck with many memories . Wow that truck is held together by love and spare parts. Great catch. LOL!! I have been to Bangkok and loved it there. That truly puts the the ram in ramshackle. Anything goes, this saying always applies to the Big Mango! I with CurryPuffy … it seems anything is possible in BKK.